I'm about done with the Lorax blocks! I have tiny scraps of the FQs left over, but I don't even want to make a border. I like it, the way it is. remember it all started with this? I only washed the FQs, NOT the panel, since I haven't had much luck with panels staying straight once they are washed. Trim long side straight and short end straight, then cut a 6” wide strip on the short end. Trim to 11”. (Scrap should be 6” x 5” approx.) Trim 11” strip in half to make two 3” strips. Cut strip in half to 2” strips. Sew long strips to side of panels. Iron toward strips. 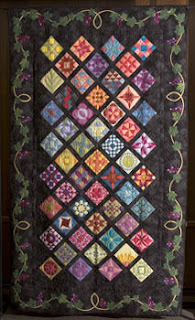 Sew skinny strips to top and bottom of panel blocks. Iron toward strips. Sew 2 pairs of 7 ¼” x 2” together on the 2” side, iron toward darker fabric. Sew these strips to sides of panel blocks with “dark” fabric being upper right and lower left. Iron toward strips. Match up the 4” and 5” strips to top and bottom, top (4”, 5”, 4”, 4”) and bottom (4”, 4”, 5”, 5”), matching with the side strips on the blocks, the two middle pieces are random. Sew to top and bottom of blocks and iron toward strips. Blocks are now 15 1/2" x 17"
Arrange blocks in a 3 x 3 layout. Sew blocks together to make quilt top. Top should be 45 1/2" x 50"
When I showed you the women of the bible quilt from the EXPO last week, someone was nice enough to send me links to this quilt- along, starting in September. It's called Patterns of faith and here is the link. There's a link on there to join a yahoo group. Then starting in September, each week will be a small bible study/devotional about the woman in the bible who's block you'll make that week. I think it'll be TONS of fun! here's the link to the patterns, either a printed package, a pdf or an EQ file. I like the Lorax blocks. And you actually think you'll have time in Sept for a new quilt along? I'm betting you'll be doing a lot of napping.